Originally posted on The Presbyterian Leader on May 17, 2012 . . . Depending on your presbytery, the job of the moderator can vary. However, we are living in a time when most of our presbyteries are facing some serious challenges: financial, church dismissals, staff restructures, struggling congregations, and more. In many cases, it has required the moderator to do more than just the task of moderating a good meeting. In fact, a moderator’s job is more than ordaining candidates and knowing your Robert’s Rules of Order. There is a vital opportunity to be a part of implementing needed change in your presbytery as a part of leadership. I am now half way through my moderatorial year in the presbytery of San Francisco. And in the year and a half that I have been in Presbytery leadership, I have seen some significant movement into healthy change in my presbytery – change that I could never imagine possible. When I first was asked to consider being nominated as Vice Moderator for my presbytery, the first thought that came to my mind was “I don’t know my Robert’s Rules of Order.” First of all, I’m an Associate Pastor so I don’t moderate session all that often and secondly, we use more consensus models of decision-making anyway. Not to mention, I have two children that are fairly young and with my husband involved in presbytery as well, this would mean that I would have to moderate with my kids next to me. 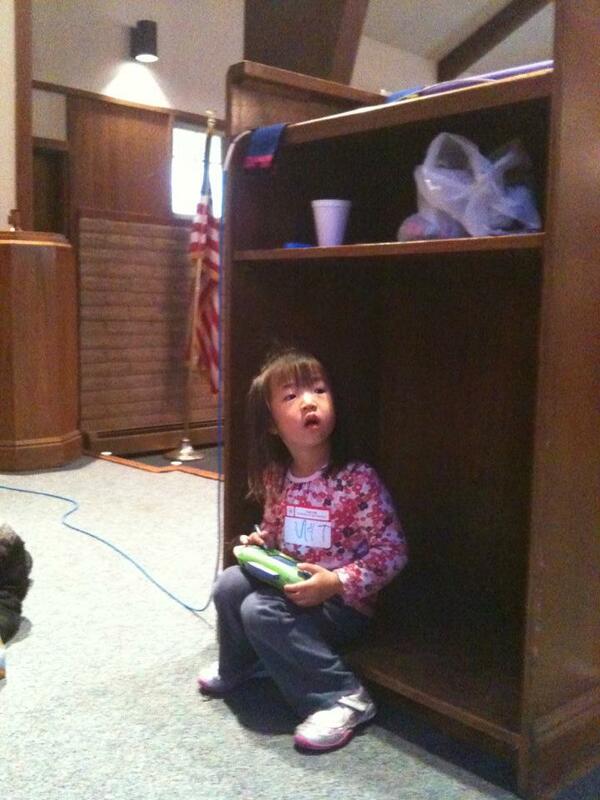 I have moderated many meetings with my daughter sitting under the podium. And while I may not know my Robert’s Rules of Order, there are other assets I bring that is unique to me as a leader: I’m a big picture thinker, creative, a storyteller, collaborative, and I love to bake. Surround yourself with support, whether it is friends, a spiritual director, or family. You are going to witness and observe behavior from people that will disappoint you, hurt you, frustrate you, and make you shake your head at times. It will wear you down and eat at you if you let it. A month into my year as moderator, I found a small group of leaders in the presbytery that I could confide, commiserate with, and trust. One of the best gifts I received was from the Chair of Council who gave me permission to let go of responsibility to all the weary stuff like gracious dismissal policies so that I could focus my energy on all the positive change that was happening in our presbytery. It also helps to have a fun goal in sight. At the end of my year, I plan to take my family to Disneyland. In the meantime, I eat lots of chocolate. Be aware of what you are realistically capable of handling. The presbytery will take all that you allow yourself to give, leaving you burned out, tired, and a little bitter. Because I began the year knowing what I wanted to focus on, I knew what I would have to give away. All requests for ordinations and installations, I pass on to past moderators. Although those are considered the perks of being a moderator, it still takes extra time and energy that I can not afford to give if I want to spend the time affecting change in other areas. As moderator, you have an opportunity to meet other moderators and get a sense of what is happening in other presbyteries. In November, I highly recommend you attend the Moderator’s Conference – not only because of its content, but because of the people who are there. Before I attended the conference, I did some research and knew which presbyteries were planning their meetings in different ways. I made sure that I connected with those moderators to learn about their process, experience, and learnings. I use social media to connect with leaders in other presbyteries to share their ideas and innovative ways. It’s also important to remind yourself that you don’t have to know everything – just surround yourself with smart and creative people. As a moderator, you try to be fair and impartial, but to moderate a good meeting demands more than just that. When planning the meeting think wholistically about how all the reports and votes fit together. Consider the meeting as a time of worship. Some presbyteries use “Worshipful Work.” My presbytery began doing simple things like adding a Call and Response after every report as a way for the committee chairs to end their report. I also started giving permission for commissioners to address the whole body and not just me when they spoke on a motion. I tried to keep routine rituals fresh and creative. At the beginning of every presbytery meeting, crosses are usually passed around, instructing each commissioner to lift up a prayer as it was received. Too freshen up an old tradtion, I recently baked over 200 sugar cross cookies as a way to invite people to pray and extend hospitality. As moderator, I am not afraid to sweeten people up if it will put them in a better mood. The Presbytery of San Francisco is so toxic that last year we actually formed a Detox Task Force to look at ways to move our presbytery to a healthier place. A part of moving to a healthier place was “changing the way we fight” which meant changing the way we met. Although people knew that they wanted presbytery meetings to be different, no one had a clue what that would look like. 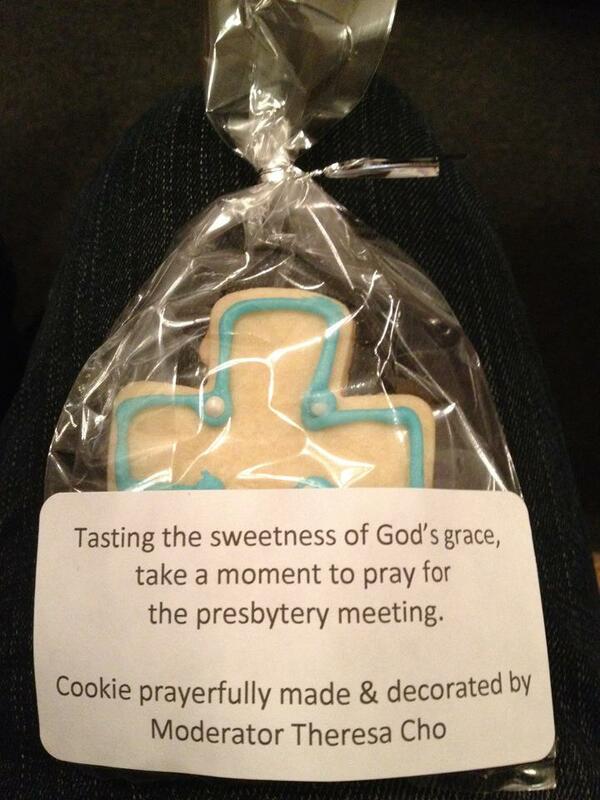 And believe it or not, there were people who actually looked forward to “fighting” at presbytery. My strategy in implementing change was to create a little confusion and chaos. I felt that if people didn’t know if they were coming or going, then maybe we would be more open to the spontaneity of the Spirit. For the first two presbytery meetings, I suggested using different process modalities like World Cafe in order to get people to start talking with each other. While there were people who were unclear what the point was, many spoke nothing but positive comments. The key to implementing a process of confusion and change is that we as leaders must also be in a position where we are trusting the process as well. Keep a pulse on what the people in your presbytery are saying to spark ideas, take the temperature, get a feel for the atmosphere, where is the Spirit moving, and where is the need for care. As moderator, you are an ambassador, so it is important to be accessible. Consider having a Moderator’s Blog on the presbytery website and communicate any important decisions coming up and changes happening. Even though all of us are “the presbytery,” the fact is whether you like it or not, YOU are the face of presbytery, meaning when things go well everyone praises you and when things make them unhappy everyone blames you. Therefore, remember to extend grace whenever possible, including yourself. Great article! By the way, the phrase “for Dummies®” is a registered trademark of Wiley Publishing. I’m one of their “for Dummies®” authors so I know they like to guard their trademarks. You may want to change the title of this post (and maybe remove the graphic that’s actually their trademarked graphic) just to be on the safe side. Thanks for the heads up! Didn’t even think of that. I think you are referring to ‘Committee of the whole’ where there is an ability to talk in groups before debate and discussion.